Earlier today, here in Phuket, I was swimming in the Andaman Sea. At one point, and for a sliver of a second, I imagined 20-foot waves crashing over me like the tsunami in 2004. It was bizarre and bleak, and I know it was prompted by my constant tracking of Hurricane Irma back home. Or maybe the floods in South Asia that sadly killed 1,000 people this summer. Or Hurricane Harvey demolishing Houston. I'm probably not the only one with natural disasters constantly on my mind. It's been rampant lately, and I think it's a good time to start a conversation about global warming. This story in the New York Times was just published. The worst Environmental Protection Agency administrator in history, Scott Pruitt, thinks it's insensitive to talk about global warming during the hurricane, but there's really no better time to talk about it, as many argue in the story. In fact, just a few days ago, Time magazine pointed out that there is "a vast and growing body of evidence that points toward global warming having an impact on the formation and severity of hurricanes." Remember Hurricane Matthew last year? The Guardian spoke to a hurricane scientist at MIT, who supported the fact a warmer world "will see a rise in the frequency of the most powerful, and therefore more destructive, variety." Hence, Irma. And Harvey. And Jose. All these hurricanes may get even worse, destroying cities, entire countries, economies, tourism and lives. Anyway, because I'm obviously obsessed with this trend, I read this story in Live Science by Jay L. Zagorsky. 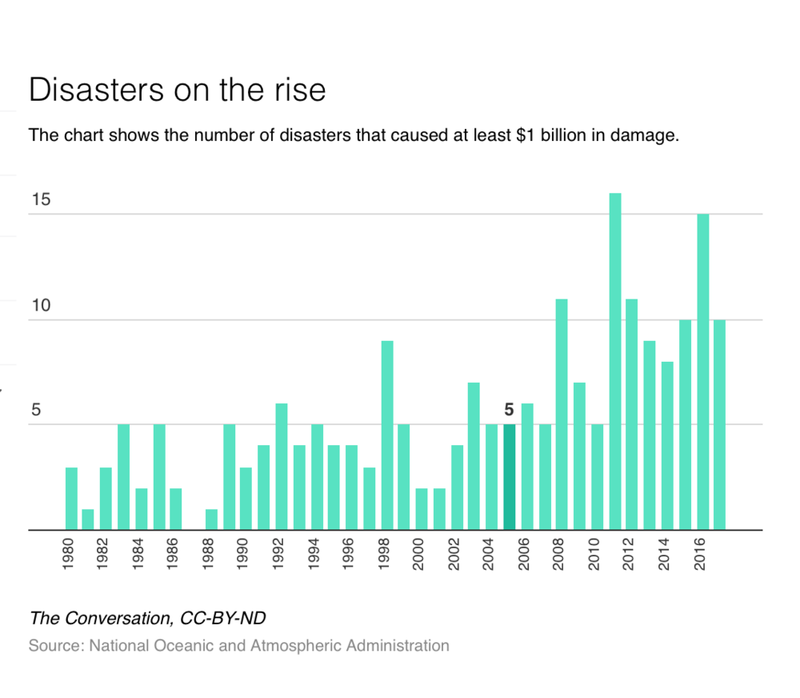 He asks: Are catastrophic disaster striking more often? Well, take a look at the graph. Oh hi, Scott Pruitt... can we have that conversation now?